These last weeks were slow. I had a couple of work issues that kept me occupied and unable to work on AM2R, and whenever I got the time to open up Game Maker, I was blocked. In the meantime, HyruleSwordsMan finally got some spare time to start with the Omega Metroid sprites. Hopefully, he´ll find more free time between work and study. 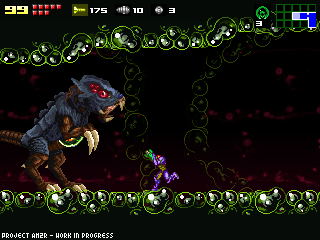 AM2R is now affiliated with Metroid: Coven, an awesome looking top-down fangame. I suggest you check it out. And this blog´s RSS feed is also available at RetroInvaders, a great site with retro gaming news, it´s one of my new favourites. Things will be better for me these days, I´ll be spending time with the project right after my birthday party (It´s tomorrow). Have a good week! Happy BIrthday!!! Hope the project will be finished soon! Happy birthday. Why were you blocked though? Happy birthday bro! and it's fine that you're focusing more on work i mean you don't want to lose your house right? and besides metroid other m will keep us occupied over the summer :P and i hope you get unblocked on whatever it is. Happy Birthday. Hope to see the fruits of your labor pay off! Not sure what cyberkid thinks he's talking about. Maybe he doesn't know about the delay. Yay Metroid Coven, AND HAPPY BIRTHDAY from some random fan who can't wait to see your masterpiece. I bet you feel real special knowing people all over the place want to wish you a happy b-day! Hey! Echo here, creator of Metroid Coven. Thanks for the association! More importantly, happy birthday man! I check your blog every day waiting to see if you have something new for us ;). Take care! And hope things work out for ya soon. Feliz cumpleaños Doc, pásala bien hoy y ánimo con el proyecto, ya falta solo un poco, sigue asi. Feliz cumpleaños!!! Que la pases bien con tus amigos y familiares. The project is looking great, I've been checking the blog like five times a day and I just can't wait for the finished project! feliz kumpleaños mano!! kreo que hablo por muchos cuando digo... pasatela bien para que termines el juego pronto jejeje saludos! hay cyberkid metroid other m has been prolonged till august. Nice job man, the demo is awesome and i can barely wait for the final version but there's one tiny problem. You can't use the speed booster in diagonal using the L Button when you do the shinespark trick. Can you fix that little problem? It's just that i played and finished almost all 2D metroid games and you can do this with the L Button. I already told all my "Metroid Maniac" friends about Metroid Confrontation, they played it and loved it (duh).Keep up the good work ! Wow, all this time I thought it would be released in June, great now another two months to wait x(, and sorry about my earlier post, I guess I read wrong. Yeah. I think everyone here is a bit disappointed with Nintendo's game-delaying tendencies. But it's even worse for me. Now I'm probably going to have to choose between Metroid: Other M and Dead Rising 2, as they're now set to get released on the same day. As a fan, I want to get Other M, but as a gamer, I know Dead Rising 2 would keep me entertained for a much longer period of time. What's a guy to do? i wish i could help remix music for am2r but im not that qualified.. but keep up the inspiring work! Happy Birthday!!! Hope you get Game Maker to work. His birthday has been over and done with for almost a week. If you're all going to demand his posts be more frequent, you should all very well be able to read them in full, including WHEN they were posted. I find it thoroughly strange that the first part of the post I take notice of is the last thing everyone else seems to notice. I didn't mean "bring the thread to a complete standstill." Come on guys! This blog has an RSS feed?? Hey man I'm a writer we all have blocks sometimes happens to the best of us..... Also HAPPY BIRTHDAY!!! Actualiza la informacion por favor.